Combine ⅓ cup EVOO and ⅓ cup balsamic vinegar with pork and marinate at least three hours to overnight. Preheat oven to 400 degrees. Remove pork from marinade and season with Tuscan Blend. Transfer to baking dish and bake for 25-35 minutes until desired doneness. Allow to rest 5 minutes before slicing. Place sweet potatoes in large pot and cover with cold water. Bring to a boil then turn down to medium-high and allow to cook for 20-30 minutes until potatoes are fork tender. Drain water, add remaining EVOO, heavy cream, maple syrup, salt and pepper. Using an electric mixer, beat until mixture is fluffy and smooth. Serve with choice of vegetable. This entry was posted in Blog on October 3, 2018 by Zack Fisch. In a small bowl whisk together balsamic, EVOO and spice blend. Pour into a resealable bag and add shrimp. Toss to coat and marinate for 30 minutes. Soak 8 to 10 wooden skewers in water, 15 minutes. Heat a grill or grill pan to medium-high. Clean and lightly oil hot grill. Thread shrimp, pineapple, and scallions onto skewers. Grill until shrimp begin to turn opaque, 2 minutes and then flip. Continue to grill until shrimp are opaque throughout and pineapple and scallions are lightly charred, about 3 minutes. Serve over cooked basmati rice. This entry was posted in Blog on July 1, 2018 by Zack Fisch. Preheat oven to 450 degrees. Make a bed of the sliced onion in a large baking pan. Wisk balsamic and EVOO together, pour over onions and toss to coat. Sprinkle the meaty side of the brisket generously with salt and course ground pepper. Turn brisket over and lay on top of onions, fat side up. Evenly season the top of the brisket with Seneca Seasoning and rub into the meat. Remove pan from oven and let rest (still covered) for 15 minutes. Uncover and let rest for an additional 15 minutes before slicing brisket across the grain. Drizzle meat when plating with pan juices and top with onions. This entry was posted in Blog on March 1, 2018 by Zack Fisch. Preheat oven to 350 degrees. Lightly grease a 9-inch spring form pan. In a medium bowl, whisk together the flour, baking powder, baking soda, salt and spice blend. In a small bowl mix together the buttermilk and vanilla. In a stand mixer fitted with a whisk attachment, beat the eggs and granulated sugar at high speed until fluffy and pale, about 5 minutes. Lower the speed to medium-high; drizzle in EVOO, beating until the oil is incorporated. Reduce mixer speed to low. Add half the flour mixture first, the buttermilk second and the remaining flour mixture third mixing each one until just incorporated before adding the next. Scrape batter into prepared pan and bake until a toothpick inserted into the center comes out clean, about 1 hour and 10 minutes. Let cool in the pan for 20 minutes then remove pan side and let cool completely. Serve with a drizzle of balsamic (and fresh fruit and whipped cream, if desired). This entry was posted in Blog on February 3, 2018 by Zack Fisch. If the carrots are thick, cut them in half lengthwise; if not, leave whole. Slice the carrots diagonally in 1½-inch-thick slices. Toss them in a bowl with the Squash Seed Oil and Cranberry Pear Balsamic. Transfer to a sheet pan in a single layer and roast in the oven for 20 minutes, until browned and tender. 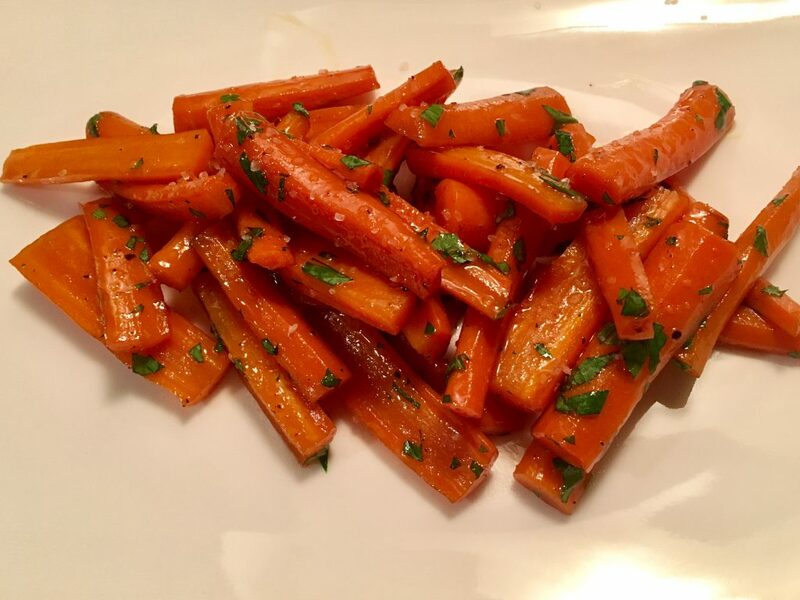 Toss the carrots with parsley, season with Himalayan Pink Salt, and serve. This entry was posted in Blog on November 1, 2017 by Zack Fisch. Arrange chicken (skin side up), potatoes and capers in a glass 13x9 baking dish. Drizzle with EVOO then season with salt and pepper. Sprinkle lemon peel zest on chicken. Remove from oven and drizzle with balsamic. Return to oven and bake for 5-10 more minutes or until chicken reaches an internal temperature of 165 degrees and potatoes fully cooked. This entry was posted in Blog on October 2, 2017 by Zack Fisch. Bring a large pot of salted water to a boil. Cook pasta al dente per directions. Drain well and place in a large bowl in the refrigerator to cool. Thinly slice zucchini, summer squash, roasted red peppers, and red onion. Dice tomatoes and cut broccoli into bite-sized pieces. To prepare the vinaigrette, whisk together balsamic, EVOO, and spice blend. Set aside. Remove pasta from the refrigerator and add vegetables, feta, and vinaigrette. Gently toss to combine. Serve at room temperature or chilled. This entry was posted in Blog and tagged Basil, Peach, Sunshine on June 30, 2017 by Zack Fisch. Preheat oven to 300 degrees. Rub ribs with Greektown Seasoning and place on foil lined backing sheet bone side down. To make BBQ Sauce: Heat EVOO in a medium saucepan over medium heat. Add onion and cook, stirring, until softened, about 5 mins. Increase heat and bring mixture to a low boil; cook 5 minutes. Reduce heat to low, partially cover, and simmer 10 mins. Remove cover. Using the back of a wooden spoon, mash blueberries against the side of the pan to release juices. Sauce can be made smoother by pacing in the blender once cooled. Brush both sides of ribs with BBQ sauce and grill for about 5 mins, until sauce caramelizes. Serve with remaining sauce. 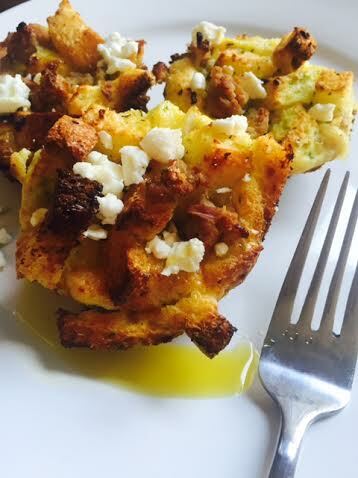 This entry was posted in Blog and tagged BBQ, Blueberry, EVOO, Greektown, gremolata on May 31, 2017 by Zack Fisch. Clean and sterilize 4 ½ pint mason jars with rings and lids. Divide green beans between the jars. In a large saucepan, stir together vinegars, oil, water, salt, and Baharat. Bring to a boil and ladle (carefully!) over green beans. Seal jars with lids and rings; place in a hot water bath and simmer but do not boil for 10 minutes. Cool to room temperature. Test for a good seal by pressing on the center of the lid- it should not move. Let pickles ferment 24 hours. Enjoy in a Mother’s Day Bloody Mary or on salads and sandwiches. This entry was posted in Blog on May 2, 2017 by Zack Fisch. In a small pot, sauté onions and garlic in Meyer Lemon EVOO until translucent. Add Phoenix Street Seasoning and stir. Add cherries, quinoa and water, turning heat to high. Cover pot and reduce to medium heat once water begins to boil. Cook for 15 minutes or until water is absorbed and the quinoa is cooked. Taste and season with salt and pepper accordingly. Chill the salad thoroughly. Garnish with blue cheese, almonds and a drizzle of Sweet Rich Cherry Balsamic Vinegar to serve. This entry was posted in Blog and tagged Cherry Balsamic, EVOO, gluten free, grain salad, meyer lemon, quinoa on March 30, 2017 by Zack Fisch. Try this recipe to give your chicken a little kick! Feel free to finish the chicken on the grill for added flavor and those lovely grill marks! Also great for fish, pork and beef. Place chicken pieces in single layer in a 9x13 glass dish or a re-sealable gallon plastic bag. Add balsamic and EVOO and massage to thoroughly distribute onto the chicken. Allow chicken to marinate at least 2 hours in the refrigerator. If marinating in a 9x13 glass dish, flip chicken half way through marinating. Once marinated, preheat oven to 350 degrees Fahrenheit. Remove chicken from marinade and place on a plate or cutting board. Liberally season each side of the chicken pieces with Jamaican Jerk. Bake chicken until internal temperature reaches 165 degrees Fahrenheit at the thickest part of the thigh but not touching the bone, about 45-50 minutes. This entry was posted in Blog on July 31, 2016 by Zack Fisch. Treat your mom to something special this Mother’s Day. For a more traditional brunch beverage, add a splash of orange juice. raspberry or strawberry if desired. This entry was posted in Blog on May 2, 2016 by Zack Fisch. Any lover of eggs for breakfast, lunch or dinner will find this perfect to get into the spirit of Spring! Our lovely Single Varietal Extra Virgin Olive Oils (EVOOs) are the perfect match to such a light and fresh recipe. Whether you prefer a buttery and mild California Sevillano or a robust and peppery Malgarejo Hojiblanca, any of F. Oliver’s Single Varietal EVOO’s will work beautifully. Toast bread in preheated oven for 5-8 minutes or until desired doneness. In the large skillet, add asparagus in one layer. Cook until tender, about 5-7 minutes. Drain, and transfer to a serving platter. Sprinkle with salt and pepper, and drizzle with extra virgin olive oil. Meanwhile, tip eggs into simmering water. Cook until desired doneness. 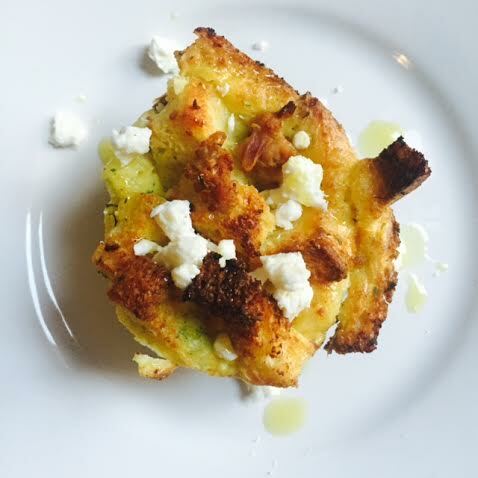 Place toasts on plate and drizzle with Single Varietal Extra Virgin Olive Oil. Place a few asparagus spears on each toast followed by one poached egg. Finish with a drizzle of Single Varietal Extra Virgin Olive Oil, Fleur de Sel and Sunshine Seasoned Pepper. For an extra burst of flavor to compliment the asparagus, add a drizzle of Lemon Bouquet White Balsamic to the asparagus. This entry was posted in Blog on March 31, 2016 by Zack Fisch. Here’s a tasty way to spice up your brussels sprouts this weekend. If they’re a little liquid-y, don’t worry – it will create a wonderful glaze in the oven! Garnish with crushed peanuts and green onions. Rinse brussels sprouts. In a medium pot fitted with a steamer insert, add about 1″ of water. Pour brussels sprouts into the basket. Cover and turn to medium heat. Cook for 10 minutes, no more. Preheat oven to 450°. Line baking sheet with parchment paper. Set aside. Meanwhile, make sauce. In a bowl, combine peanut butter, Squash Seed Oil, soy sauce, Tunisian Harissa EVOO, and honey. Whisk until well combined. Once sprouts have cooked for 10 minutes, drain and return to pot. Pour 3/4 of the sauce over the sprouts. Reserve leftover sauce for later. Stir to evenly coat. Pour onto lined baking sheet. Bake for 5 minutes. Stir and bake for 5 minutes more or until crispy and slightly charred. Remove from oven. Stir remaining sauce over. Add to a serving dish. Garnish with peanuts and green onions. Serve warm. This entry was posted in Blog on January 16, 2016 by Zack Fisch.